Seoul Selection is happy to announce the imminent release of the October issue of SEOUL, Seoul Selection’s travel and culture monthly. 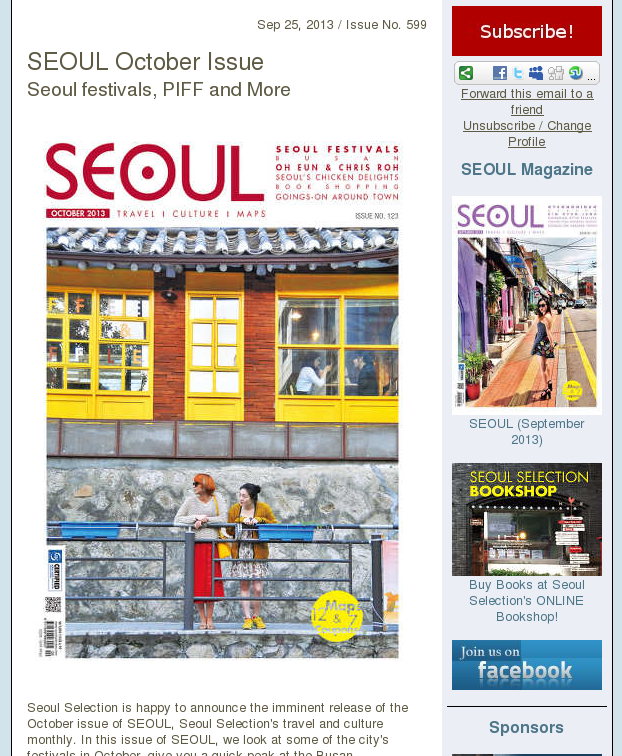 In this issue of SEOUL, we look at some of the city’s festivals in October, give you a quick peak at the Busan International Festival, show you where to buy a good book, talk with poet Oh Eun and designer Chris Roh, and much, much more. And if that’s not enough, take a look at our Goings On Around Town, your roundup of the month’s concerts, festivals, exhibitions and other events. Pick up your copy this week at a bookstore near you. – Hide the women and children: soju takes aim at America. – Japan’s First Lady defends her love of Korean culture. – Mexico is becoming a land of opportunity for migrants, including Koreans. – I’m not sure I’d describe Spam as a luxury item, even here. 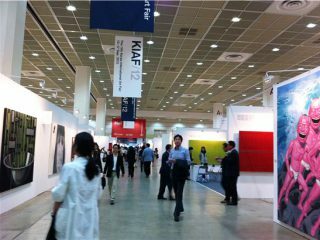 – Northern Seoul gets an art gallery. Finally. – Dale experiences the Templestay at Seoul’s International Seon Center. – Here’s a map (in Korean) of when to expect the leaves to turn color. – Seoul, seen from Mt. Bukhansan. – The QiRanger explores the joys of Korean shoe repair. – Yours Truly spent the Chuseok holiday photographing foggy sunrises, old fortress gates and trains. The festival aims to promotes the traditional culture and art of Suwon and preserve the spirit of Hwaseong Fortress, a UNESCO World Cultural Heritage site. The filial affection and political innovations of King Jeongjo, who built the fortress in the late 18th century, will also be cherished. Visitors will be treated to a range of performances and reenactments: the king’s royal procession to his father’s grave and the ensuing memorial rite; a nighttime military drill; the 60th birthday party for the king’s mother, Lady Hong; a court service test; and more. At the spectacular Jinju Namgang Yudeung (Lantern) Festival, colorful lanterns parade along the Namgang waterfront across from Jinjuseong Fortress and Chokseongnu Pavilion. Visitors will enjoy a parade of traditional lanterns while floating lanterns downriver and hanging lanterns to make wishes. The festival dates back to the Japanese invasions of Korea (1592–1598), when lanterns were used as a military strategy to prevent Japanese troops from wading across the Namgang River. Also on offer are an exhibition of the world’s traditional lanterns, and many more participatory cultural programs. The walled city of Suwon is the best constructed (late 1700’s), most original /well preserved examples of monumental fortifications in Korea. The current city walls were built to protect the new royal country palace, the “Hwaseong Haeng Gung,” which itself is an exquisite example of Korean monumental architecture, constructed on a more human and aesthetic style for its country setting and purpose. This excursion to Suwon, its country palace and impressive walls, gates and fortifications will be led by Mr. Peter Bartholomew, a 45 year resident in Korea who has made intensive study of the Joseon Dynasty from an architectural and historical perspective. 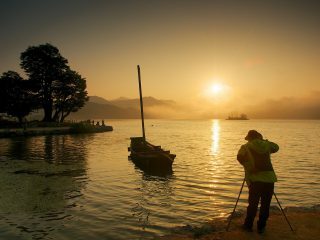 Photographer capturing the scenery of Yangsu-ri, Yangpyeong, Gyeonggi-do. Photo by Robert Koehler.